The two most debased moments of Donald Trump’s speech to Congress. Donald Trump’s speech to Congress was just another reflection of his defilement of our institutions. President Donald Trump arrives to deliver an address to a joint session of the U.S. Congress on Tuesday in Washington. 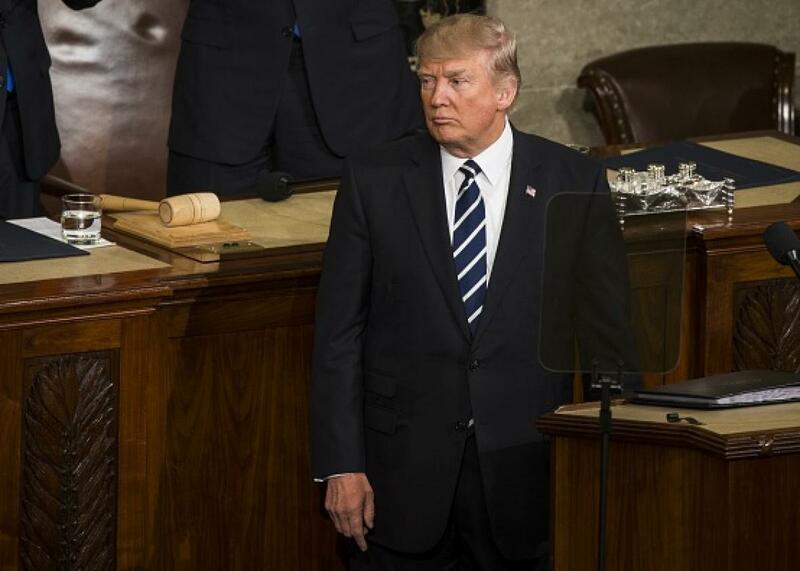 Toward the end of Donald Trump’s address to a joint session of Congress on Tuesday night, he called out to the widow of Chief Special Warfare Operator William “Ryan” Owens, a Navy SEAL who died Jan. 29 in Yemen, killed in a raid Trump ordered. Earlier on Tuesday the president shrugged off responsibility for the mission, telling the hosts of Fox and Friends that it was “started before I got here,” and blaming the loss of the Navy special operator on his generals. Owens’ father has refused to meet Trump, saying he believes that the raid where his son died was hastily planned. The administration insists that the mission yielded valuable intelligence—a claim Trump reiterated on Tuesday—but Pentagon officials have told journalists that isn’t true. If Trump were capable of shame, Owens’ death should shame him. Instead, in his first major address since the inauguration, he turned Owens sobbing, bereaved widow into a prop. As Carryn Owens stood next to Ivanka Trump, tears streaming down her face, the assembled crowd heartily applauded her monumental sacrifice. She appeared overcome. Then Trump ad-libbed, “And Ryan is looking down, right now, you know that, and he’s very happy, because I think he just broke a record.” In other words, Owens’ death had a happy ending because a lot of people clapped at Trump’s big speech. To be honest, for much of Trump’s address, I worried that it sounded more presidential than usual and would thus bolster his repulsive reign. He read off a teleprompter and used a speechwriter with a sunnier disposition than the one who coined “American carnage,” a key phrase in his last big address. After weeks of refusing to speak out about anti-Semitic threats and violence—and days of silence about a hate-fueled shooting in Kansas—Trump opened by condemning “hate and evil in all its forms.” (Naturally, he didn’t say anything about anti-Muslim violence.) He reminded us all that he’s a great salesman, making a number of nice-sounding promises untethered from reality. He said that his administration would work to “invest in women’s health, and to promote clean air and clear water.” (In reality he intends to defund Planned Parenthood and gut the Environmental Protection Agency.) He called for health care reforms that “expand choice, increase access, lower costs, and at the same time, provide better health care.” (As Republicans well know, health care reform without trade-offs is impossible.) Watching Trump’s smooth delivery, I imagined it going over great with the minority that voted for him, and I feared that mainstream pundits, ever-eager to sound nonpartisan and reasonable, would praise Trump for pivoting from the divisive mode of his first month in office. And, as I was writing this, many were. But those positive reviews can’t mask the fact that by the end of the speech, Trump was back to being his familiar foul self. Once again, he put victims of crimes committed by immigrants in the audience, a standard trope of his from the campaign. He announced that he’d directed the Department of Homeland Security to create an office devoted to Americans preyed on by immigrant criminals to be called VOICE, or Victims of Immigration Crime Engagement. Immigrants, of course, are actually less likely to commit crimes than native-born people, but that is immaterial to Trump, who has now enlisted the American government in a xenophobic propaganda operation. Had it not been for the stunt with Owens’ widow, the rollout of VOICE would have been the most debased moment of the night. Though he’s now been in office over a month, it’s still jarring and surreal to see Trump in the presidential place of honor. Maybe I was imagining it, but I thought I could see my own sense of uncanny horror reflected back in the pained expressions of Democrats in the audience. Trump’s presidency still feels like a nightmare—or an occupation. The rebellion started as a quiet protest spoken by families of all colors and creeds. The quiet voices became a loud chorus as thousands of citizens all spoke out together from cities small and large, all across our country. Finally, the chorus became an earthquake—and the people turned out by the tens of millions. Of course, millions more turned out to stop Trump—particularly in cities small and large. Every time Trump refers to his white, minority coalition as “the people,” he’s telling the majority of the American people who oppose him that they don’t matter. And for now, as far as our government is concerned, they don’t. The calls for bipartisanship with which Trump ended his speech weren’t a gesture of outreach but a demand for submission. No matter what the Beltway media says, Democrats should resist. No matter how great a marketer he is, Trump still defiles everything he touches.